1. 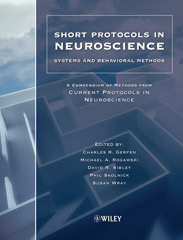 NEUROPHYSIOLOGY (Michael A. Rogowski). 1.1 Fabrication of Patch Pipets. 1.2 Whole-Cell Voltage Clamp Recording. 1.3 Preparation of Hippocampal Brain Slices. 1.4 Synaptic Plasticity in Hippocampal slice Preparation. 1.5 Recording and Analyzing Synaptic Currents and Synaptic Potentials. 1.6 Voltage Clamp Recordings from Xenopus Oocytes. 1.7 Preparation and Maintenance of Organotypic Slice Cultures of CNS Tissues. 1.8 Patch Clamp Recording in Brain Slices. 1.10 Acute Isolation of Neurons from the Mature Mammalian Central Nervous System. 1.11 Patch Clamp Recording from Neuronal Dendrites. 2.2 Methods for Sample Preparation for Direct Immunoassay Measurement of Analytes in Tissue Homogenates: ELISA. 2.3 Assessment of Cell Viability in Primary Neuronal Cultures. 2.4 Measurement of NO and NO Synthase. 2.5 Measurement of Oxygen Radical and Lipid Peroxidation in Neural Tissues. 2.8 Microdialysis in Nonhuman Primates. 2.9 Detections and Quantification of Neurotransmitters in Dialysates. 2.10 Saturation Assays of Radioligand Binding to Receptors and Their Allosteric Modulatory Sites. 2.11 Uptake and Release of Neurotransmitters. 2.12 Measurement of Chloride Movement in Neuronal Preparations. 2.13 Measurement of Cation Movement in Primary Cultures Using Fluorescent Dyes. 2.14 Measurement of Second Messengers in Signal Transduction: cAMP and Inositol Phosphates. 2.15 In Vivo Measurement of Blood-Brain Barrier Permeability. 3. BEHAVIORAL NEUROSCIENCE (Michael A. Rogowski). 3.1. Assessment of Developmental Milestones in Rodents. 3.3. Motor Coordination and Balance in Rodents. 3.4. Basic Measures of Food Intake. 3.5. Sexual and Reproductive Behavior. 3.6. Parental Behaviors in Rats and Mice. 3.7. Application of Experimental Stress in Laboratory Rodents. 3.8. Rodent Models of Depression: Forced Swimming and Tail Suspension Behavioral Despair Tests in Rats and Mice. 3.9. Rodent Models of Depression: Learned Helplessness Induced in Mice. 3.10. Animal Tests of Anxiety. 3.11. Assessment of Spatial Memory Using the Radial Arm Maze and Morris Water Maze. 3.12 Cued and Contextual Fear Conditioning in Mice. 3.13 Conditioned Flavor Aversions: Assessment of Drug-Induced Suppression of Food Intake. 3.14 Measurement of Startle Response, Prepulse Inhibition, and Habituation. 4. PRECLINICAL MODELS OF NEUROLOGIC AND PSYCHIATRIC BEHAVIORS (Phil Skolnick). 4.1 Preclinical Models of Parkinson's Disease. 4.2 Rodent Models of Global Cerebral Ischemia. 4.3 Rodent Models of Focal Cerebral Ischemia. 4.4 Inducing Photochemical Cortical Lesions in Rat Brain. 4.5 Traumatic Brain Injury in the Rat Using the Fluid-Percussion Model. 4.6 Models of Neuropathic Pain in the Rat. 4.7 Dural Inflammation Models of Migraine Pain. 4.8 Animal Models of Painful Diabetic Neuropathy: The STZ Rat Model. 4.9 Models of Nociception: Hot Plate, Tail Flick, and Formalin Tests in Rodents. 4.10 Place Preference Tests in Rodents. 4.11 Intravenous Self-Administration of Ethanol in Mice. 4.13 Experimental Autoimmune Encephalomyelitis (EAE). 4.14 Models of Amyotrophic Lateral Sclerosis. 4.15 Measurement of Panic-Like Responses Following Intravenous Infusion of Sodium Lactate in Panic-Prone Rats. 4.16 Chemoconvulsant Model of Chronic Spontaneous Seizures.